Read the questions below and then click on the hyperlinks to find the answers! Write your answers down on a piece of scratch paper and turn it into your teacher at your next computer class. Good luck! 1. What rule is Rule Number 6 for "Kids Rules for Online Safety"? 2. What do they mean in the last Safety Tip for Internet Safety? 3. What information should you avoid giving out online? 4. According to this site, when someone uses bad language online, what should you do? 5. 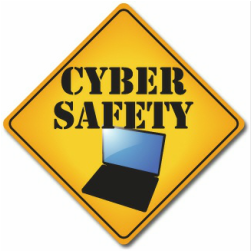 Listen and follow along with Safe Cyberspace Surfing guideline article. Discuss rule number 1 with a parent. 6. What is tip number six of Tips for Internet Safety and good manners? 7. What rule is Rule Number 2 for "Kids Rules for Online Safety"? Great job! Remember all these important rules when you are on the internet so you can be a good Digital Citizens!